The holiday season in Mexico is a joyous occasion filled with culture, tradition, color, religious observations, food, but mostly it is a time for rituals. With the year coming to a close, Mexicans are gearing up for these traditional New Year’s rituals which are believed to bring good luck, prosperity, love, and blessings in the coming year. 1. 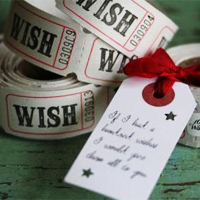 WISHES: In a normal piece of paper, write your wishes for the upcoming year and place them on top of the table. Burn the paper when that wish comes true. 2. GOALS: As the New Year’s Eve midnight countdown begins, eat 12 grapes making a wish for each one, representing the 12 months of the next year. (Hint: eat seedless grapes.) A sweet grape means it will be a good month next year; a sour grape, a bad month. 3. HAPPINESS: On New Year’s Eve, women who want love and passion in the next year wear red underwear; for happiness and prosperity, yellow underwear; for health and well-being, green underwear; for true love and friendship, pink underwear; for hope and peace, white underwear. Never wear black clothing. 4. LUCK: Display a rimmed tray with a candle at the center, and ask family and friends to deposit change in the tray, afterwards filling it with water for good luck. 5. PROSPERITY: Place a few candles on a white plate surrounded by lentils, beans, rice, corn, flour and a cinnamon stick to spice things up. Allow candles to burn all night until melted; then peel the waxy food mixture off of the plate and bury it for abundance and for food to be on your table always. 6. FORTUNE: Eat a tablespoon of cooked lentils, or give a handful of raw lentils to family and friends for good fortune. 7. MONEY: At midnight on New Year’s Eve, open the door and symbolically sweep out ‘the old’. At midnight, toss 12 cents/coins on the ground and sweep them into the house for prosperity. 8. NEW: Clean the house; take a bath; or wash the pets and cars on New Year’s Eve for renewal. Sweep and mop from the inside outwards. Mop the house with cinnamon water. The water is heated with cinnamon sticks as if you were making tea. Burn incense before midnight. 9. RENEWAL: On New Year’s Eve at midnight, throw a bucket of water out the window for renewal. 10. SAFETY: Watch fireworks on New Year’s Eve to frighten away evil spirits, allowing safe passage into the next year. 11. TRAVEL: On New Year’s Eve at midnight, take empty suitcases for a walk outside; encircle the house or walk around the block for the distance to be traveled next year. Another option is to gather the suitcases in the center of a room, and walk around them several times. Whatever wish or goal you have for 2015, we wish you the best and hope to see you next year. Until then, have a safe New Year’s Eve and a festive New Year’s Day with your loved ones. Next year, maybe you’ll ring in the New Year with us. See our Specials & Packages here. Can you add any to the list? I hadn’t heard of that one, Bebe. Thanks for the insight. Hope you had a wonderful New Years and this 2011 is filled with prosperity, happiness, and joy. I live in the south (USA) and we always have black-eyed peas and collard greens on new year’s day. They represent money in the new year – the black-eyed peas represent coins and the collards represent bills! This was very helpful thanks a bunch.